Begin with a sightseeing ride at Acapulco Diamante and enjoy breathtaking panoramic views of both Bays. Afterwards, be welcomed as a guest at Pierre Mundo Imperial, originally built in the 1950's to serve as the vacation home of oil tycoon and philanthropist J.Paul Getty. Bask in the sun, get some rest and enjoy a delicious lunch. Tucked among an oceanfront landscape of mango, lime and palm trees, Pierre Mundo Imperial offers a cozy, intimate retreat in Acapulco’s upscale Diamante district. 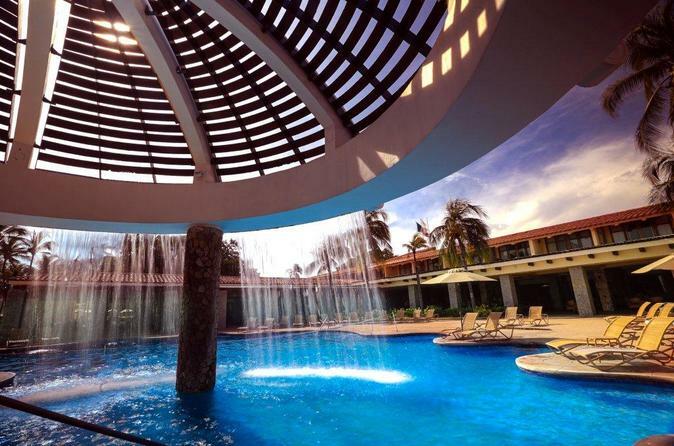 The resort was originally built in the 1950’s to serve as the vacation home of oil tycoon and philanthropist J. Paul Getty, and its Mexican architecture, stone pillars and wood accents offer a warm, authentic alternative to Acapulco’s bustling mega resorts. You will be picked up from your hotel at 10:30 am to head to Acapulco Diamante. A brief sightseeing with two stops at outstanding Panoramic View points of both Santa Lucia and Puerto Marques bays will be provided. You will then be taken to the iconic Pierre, lounge by any of the three beautiful pools and enjoy boasting views of lush tropical gardens, fountains and the Pacific Ocean or stroll to Playa Revolcadero, one of the top beaches in the area. You will be entitled to lunch (three course set menu at chefs choice or buffet if available) and two non-alcoholic drinks. You will finally be driven back at your hotel.